Ann Geisler and Melanie Hart had a wonderful time at the ACNM Annual Meeting in Nashville, Tennessee. Ann Geisler has been to dozens of Midwifery Events and Conferences, and said the ACNM Meeting was the largest conference she has ever attended. The ACNM Annual Meeting had nearly 2,000 pre-registered attendants and 400 midwifery students! Ann Geisler was able to talk with ACNM President-elect, Ginger Breedlove, while at the event. Ginger was extremely appreciative of Southern Cross Insurance’s attendance at the event and we are thankful to her and ACNM for putting on such an amazing meeting. We foresee a lot of great things for ACNM with Ginger on board! Ann Geisler was also delighted to run into ACNM Senior Practice Advisor, Eileen Beard, at the event. Eileen is a great friend to Ann, and a real friend of Southern Cross. Lastly, Ann spent some time with Kitty Ernst, Founder of AABC, at the meeting. Kitty was proud of AABC’s recent award of a $5.35 million grant for the Strong Start for Mothers and Newborns Initiative. Congratulations AABC! 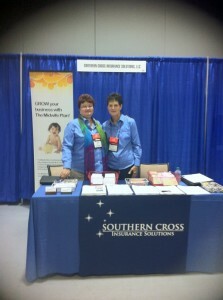 Southern Cross Insurance would like to thank everyone who stopped by our booth. We really value our friends and clients, and enjoy learning about each one of your new endeavors. We would also like to thank ACNM for providing a well-attended and great venue for so many inspiring people to meet. If you have any questions about the event, Ann Geisler is happy to connect! You can email her at ageisler@southerncrossins.com or call her at (888) 985 – 3542.